Could something new to science be found in your backyard... or mine? 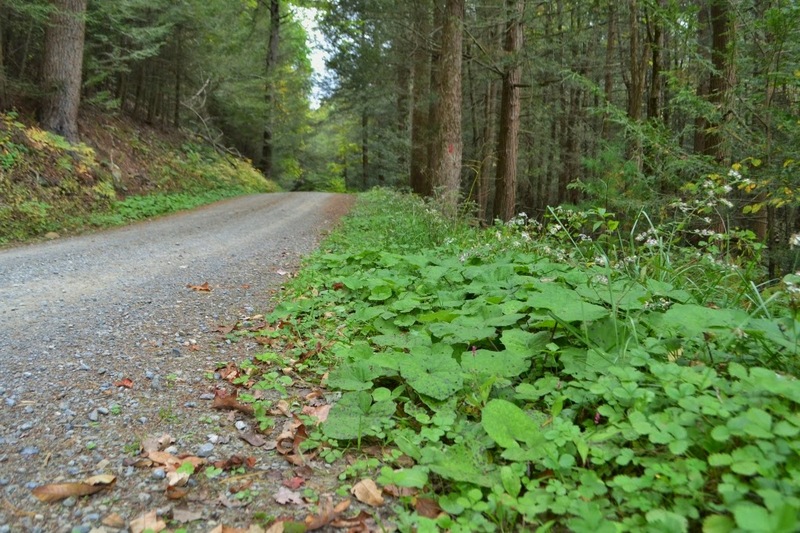 Perhaps I may have made such a discovery - a very small one - as I drove along a woods road not far from home. As I drove along (looking for a property corner pin), I spotted some leaf mines on Coltsfoot leaves. 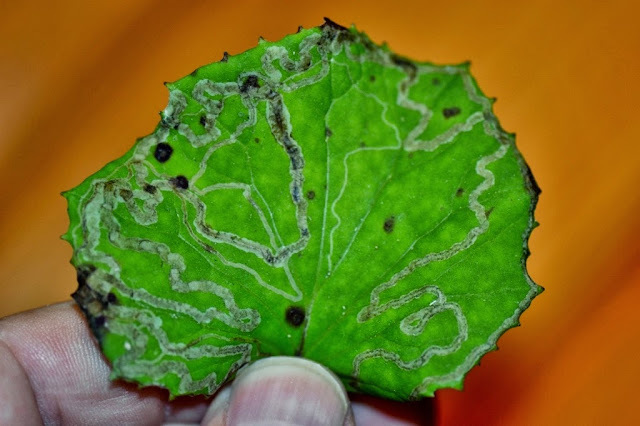 I stopped to take a look and thought to myself, "Those larvae make such long, torturous leaf mines... I wonder what mines those leaves?" "Wouldn't it be fun to see what makes those twisting tunnels on the coltsfoot leaves?" Well, in hopes of rearing an adult from the leaf mines, I picked a couple leaves and put each leaf in its own container. 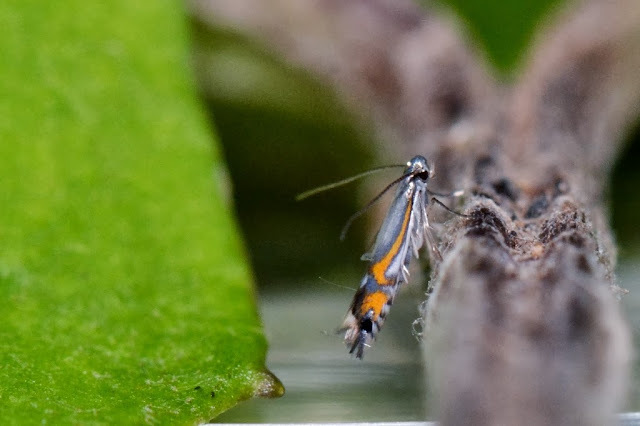 A few days later I noticed there were several tiny, shiny micromoths zipping around in their rearing containers. These moths were a shiny metallic color that, in the right light, are a subtle blue-grey. The moths have orange racing-stripes decorating their wings as you can see in the photo below. Here is a photo of the flashy little moth, Phyllocnistis insignis. Again, these are very small moths. P. insignis would be dwarfed by a grain of rice. I puzzled over these coltsfoot dwellers for awhile and couldn't find answers, so emailed an expert and here is a portion of his reply. "... There is, however, no published record of this moth mining in coltsfoot, and you may well be the first person to have reared it from this plant. I have been seeing these mines for some time, and had assumed they must be P. insignis, but it's great to have this confirmation." Ahhh, so my coltsfoot dwellers are well known, just not documented in association with the plant from which I reared them. Therefore, I'll publish this little discovery here in hopes that it counts as a 'published record' and adds a tiny bit of info to the body of scientific knowledge. 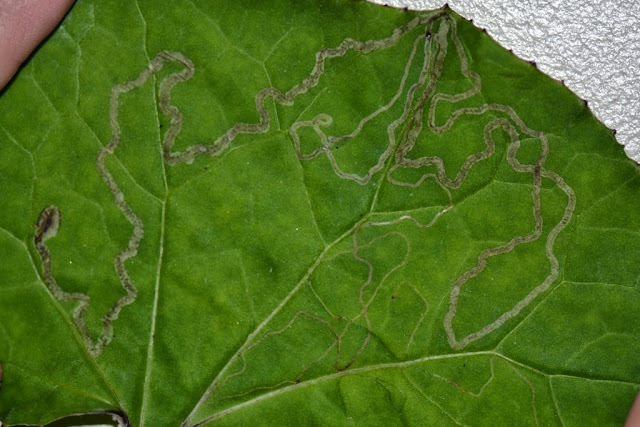 First, here is a photo of a leafmine typical of the many I have found on coltsfoot leaves (Tussilago farfara). 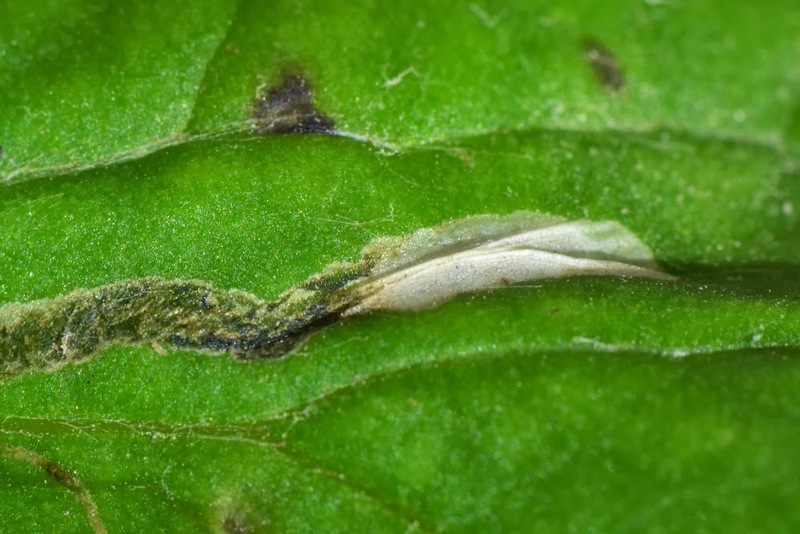 The twisting tunnel of the P. insignis larva is on the upper surface of the leaf. 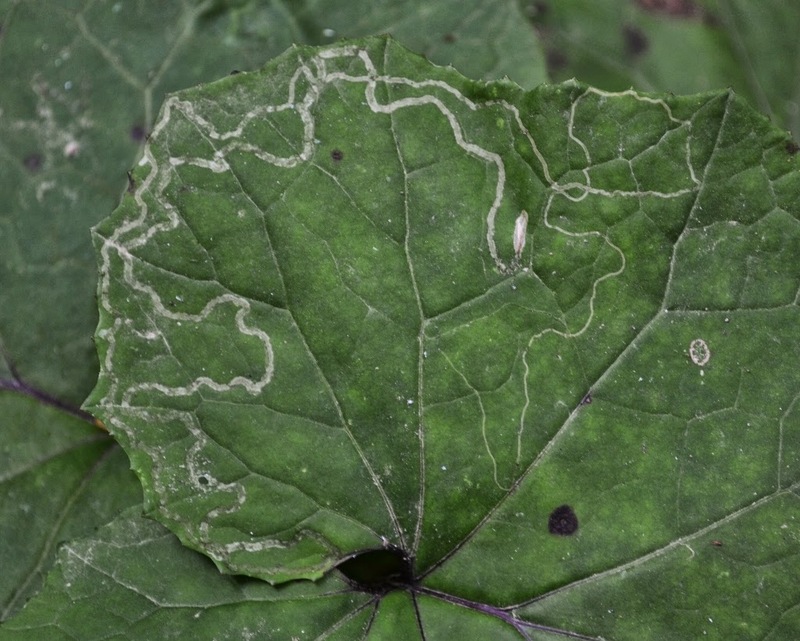 Here is a photo of a leaf miner larva, P. insignis, as it feeds on a coltsfoot leaf. 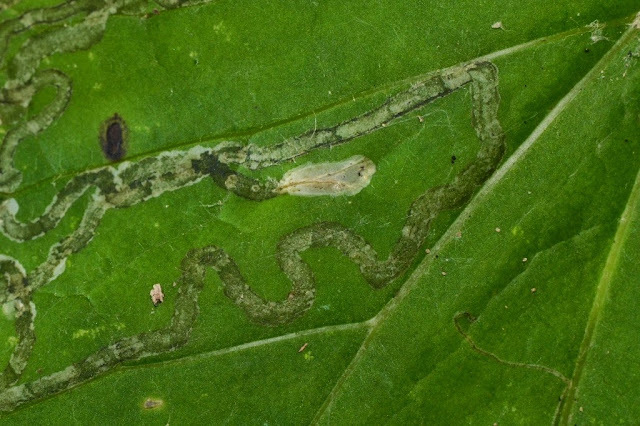 The mines are exceptionally long because these particular leaf miners feed solely on sap from the damaged leaf tissue. When the leaf mining larvae are finished feeding and are ready to pupate, they make a kind of three-sided chamber right there on the leaf surface at the end of their feeding tunnels. 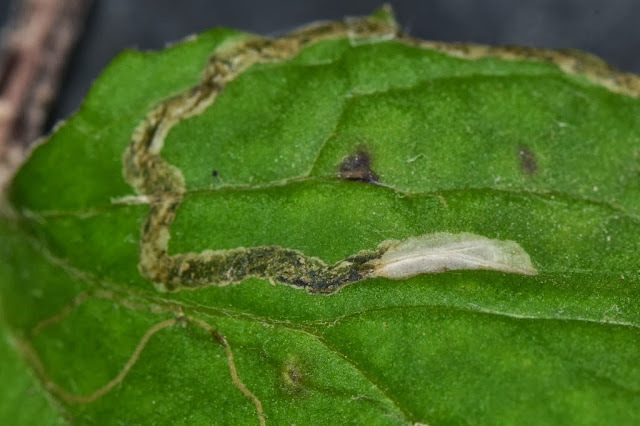 The pupal chamber on the coltsfoot leaf pictured below, is very near where the leaf miner started mining the leaf. See the thin trace of the early mine on the lower left of the pupating leaf miner? Here is a close-up photo of a silken pupal chamber. 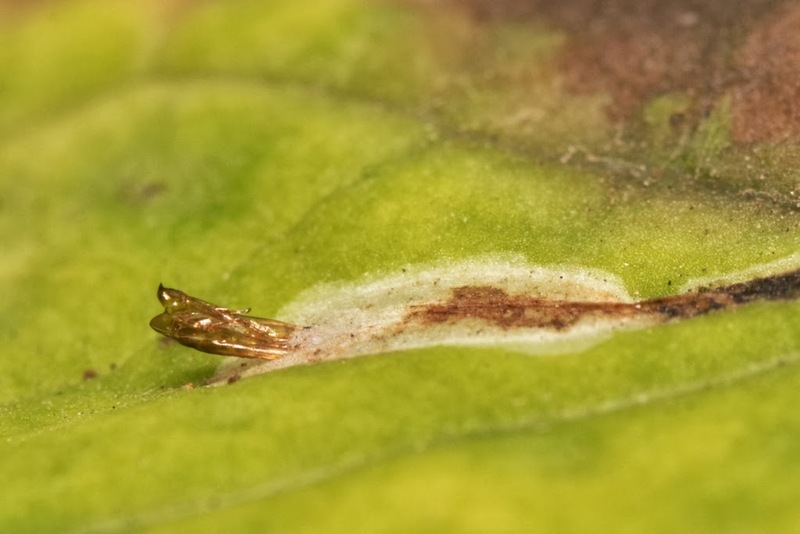 The photo below shows a pupal chamber with a spent pupal case protruding out the end. The photo below shows the freshly emerged moth. 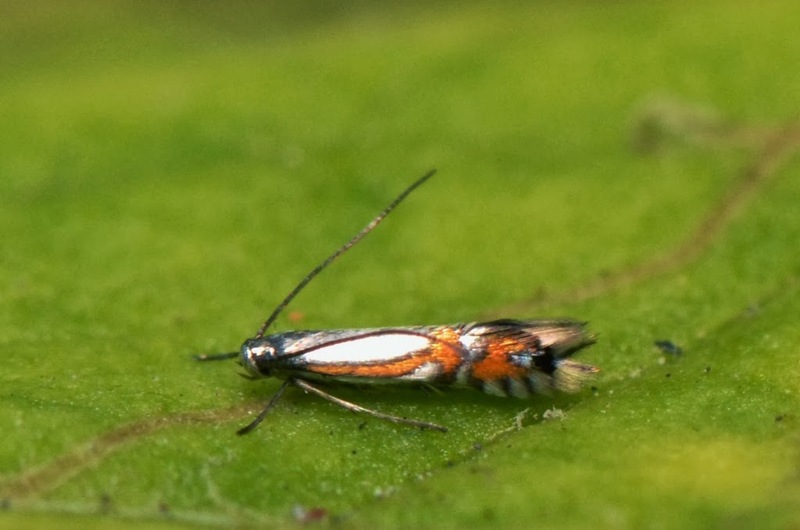 Most of the life story of this flashy little moth is shown in the photo below. 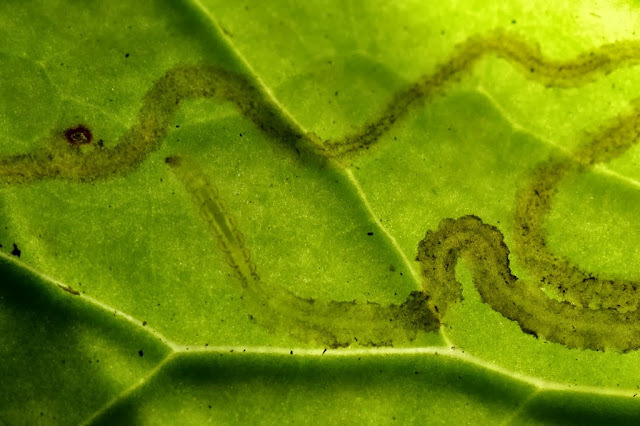 A story that starts out as a thin squiggly line and ends in a pupal chamber after traveling over various parts of a leafy world. Here is another 'volume' written by P. insignis. Amazing isn't it? A resume... a life story... written on a leaf. 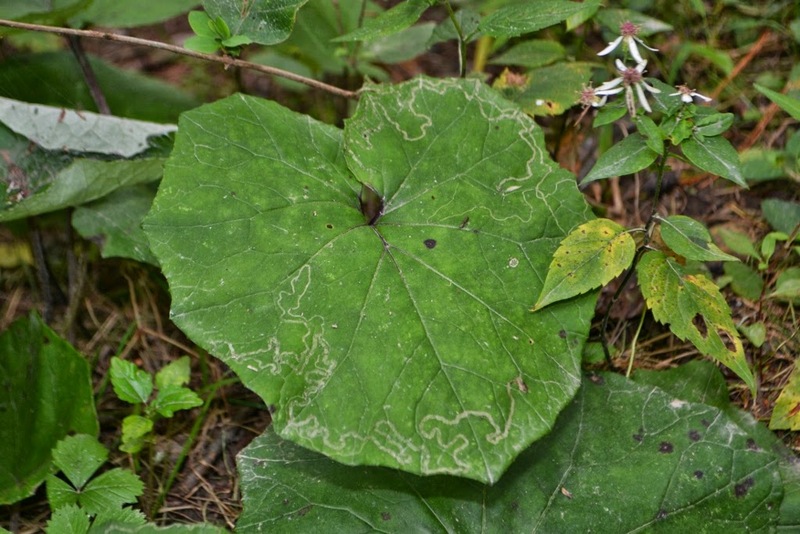 A leaf story, which in my 'backyard', was written a on coltsfoot leaf... and may have gone undocumented until now. Dana, isn't that exciting ? Congratulations ! What lovely teeny, tiny insect. Yes, actually, the word I've used is, "encouraging", since I've been puzzling over a number of other small, natural mysteries. Perhaps someday I'll post some of the clues, or perhaps, I'll wait until, by various means set in motion, these mysteries are solved. Have you ever discovered something about which little has been written? Cool discovery! That is exciting... I was taken by the fact of how beautiful this moth is and that it would be dwarfed by a single grain of rice. That is amazing! Maybe you can answer my question there...?? Interestingly, the beauty of this moth is only visible with a hand lens or a macro lens. The moth is about half the length of a grain of white rice, and much thinner. Regarding nettles, I haven't posted about them yet. I have been watching some stem galls on False-nettle. 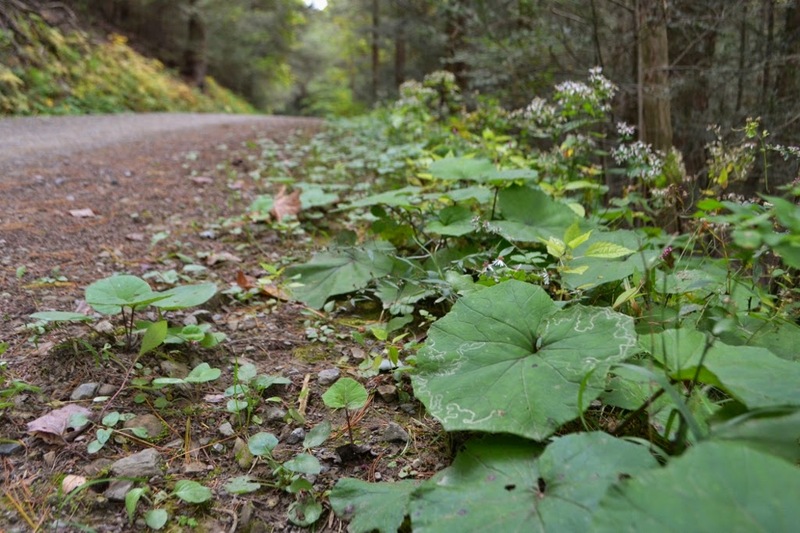 I'll comment on your blog about the plants you saw.